Amelia completed a 5 months internship with MER, as part of her placement year, after completing her 2 years of Ocean Science and Marine Conservation degree at Plymouth University, UK. Her time at MER included a variety of opportunities; from engaging with new scientists (from MER, Spain, Greece, India, and the UK), to participating in a variety of projects. Amelia wanted to learn about marine research outside of conservation. 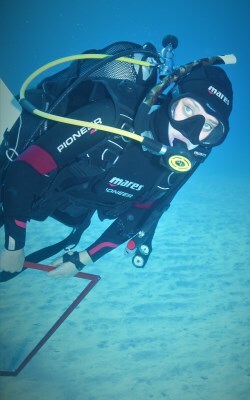 For this reason, she participated in as many tasks as possible, not only learning the typical Eastern Mediterranean characteristics but also working on a Risk Assessment for the Lagocephalus sceleratus, collaborating data for the RELIONMED, planning and helping write-up of the RECONNECT progress report. Furthermore, she spent time in the lab sorting macrofauna, preparing Posidonia oceanica tissue for DNA analysis, as well as carrying out aging, morphometric and weight measurements of the P. oceanica samples. Field work activities that Amelia was involved in, and took pride in completing were: P. oceanica shoot counts, sediment and water sampling, laying quadrats that will be used by citizen scientists, photographing marine biodiversity, lionfish surveys, and assessing/removing litter along transects. Amelia’s highlights from MER were the support and responsibility the team gave her, in the field work planning, scuba-diving activities and the write-ups. This internship opportunity has set the path for Amelia’s research confidence, as well as helping promote her campaign against plastic. She now intends to learn more about the fisheries industry, finishing her degree alongside her educational activities on plastics and ideally find work in marine conservation research.